Saint Francis Foundation and the Saint Francis Medical Center Auxiliary awarded healthcare scholarships to 23 local students on August 1. 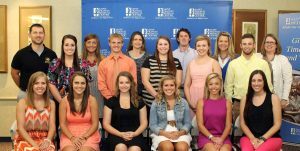 Each student received $2,000 in scholarships toward a degree in a healthcare-related profession. The Saint Francis Healthcare Scholarship Program was created in 1980. The program is funded by Saint Francis Foundation and the Saint Francis Auxiliary. Since its inception, the program has provided more than $487,000 in education scholarships to college students in an effort to encourage participation in professional healthcare careers. Scholarship recipients must have completed at least one year in an accredited healthcare program, maintain a minimum of 3.0 GPA and complete the application and essay requirements by the scheduled deadline. They must also reside within Saint Francis Medical Center’s service area, as defined in the application. Back row, from left: Cody Van de Ven, Brooke Glastetter, Heather Kyle, Liam Maher, Debbie Franklin and Jessica Riley. Middle row, from left: Kristen Vetter, Kodi Byrd, Kaitlin McGrath, Brianna Lueders and Ryan O’Rear. 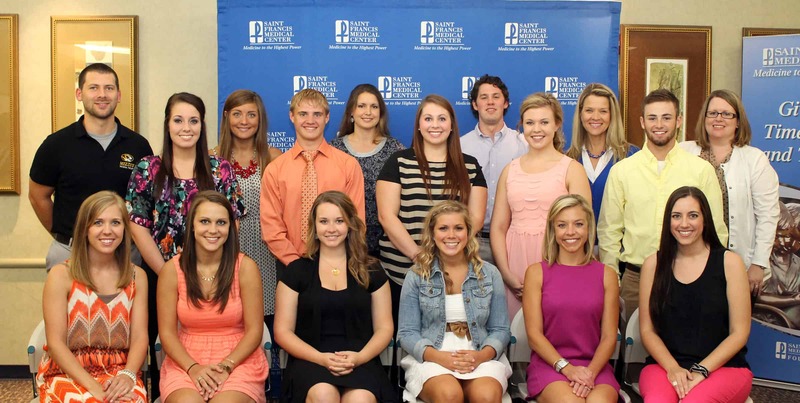 Front row, from left: Chelsey Stoverink, Lauren Seiler, Rachel Job, Jordan Myer, Merritt Gerlach and Kaycee Dukes. A special thank you is given to the committee for giving their time and expertise in reviewing the 2014 scholarship applications. The members of the committee include: Thelma Irwin, Scholarship Committee Chair; B.J. Bowman; Nicole Chance; Connie Laurentius; Kathy Marchi; and Lori Wills.